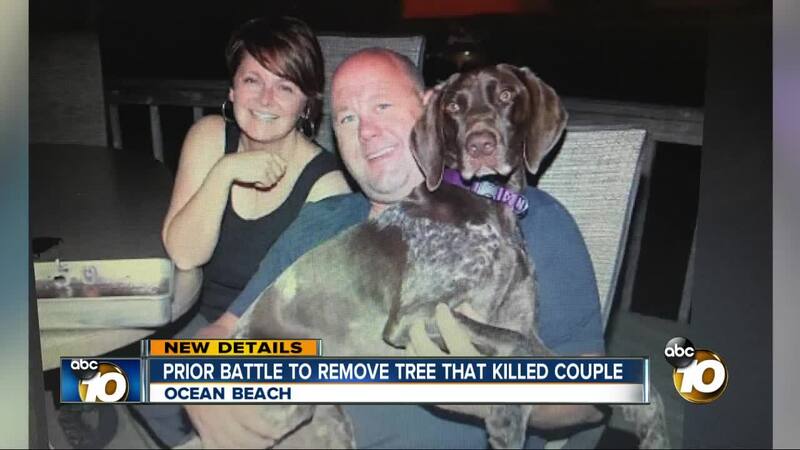 SAN DIEGO (KGTV) - The sister of a North Dakota man killed when a Torrey Pine tree crushed his vacation rental home in Ocean Beach Monday is remembering her brother and sister-in-law. Tammy Reynolds said Troy and Jessica Nelson were staying at the house on Santa Monica Avenue with Jessica's brother, Ryan, while they attended a trade show. Ryan called Reynolds to say he woke up to a noise "that sounded like an airplane hit the house". "Next thing he remembers is that he was downstairs in the basement and he kept trying to call out to Troy, and no response," said Reynolds. "He stood outside the house and kept telling them [first responders] his brother and sister, that's how close they were, his brother and sister were inside the house and...trying to tell them, they got to get them out. He stood there for two and half hours and said...they couldn't get them, that they were already deceased." "All the traveling they do, my brother was an avid hunter. You know, you worry about things like that ice fishing, and all these different things that he does, and you never think he's going to go somewhere and sleep and a giant tree is going to fall on him and take their lives and then to find out that these trees should have been removed 50 years ago, that's the part that really, really makes you angry," Reynolds said. The Nelsons had no children but their "dogs were their family", according to Reynolds. "Everyone's talking about what a loss the community is going to feel with this. They're a huge asset to Grand Forks, they're a huge asset to the community and they're very well known; this is definitely a big loss for the community."